Prince Harry and Meghan Markle revealed new details about their relationship -- including how Harry proposed to the "Suits" actress -- in their sit-down interview with the BBC on Monday, their first since announcing their engagement. Speaking with Mishal Hussein, Markle and Harry appeared completely at ease and totally in love as they talked about the low-key proposal just hours after sharing their exciting news with the world. "It happened a few weeks ago," Harry started about his proposal. "Earlier this month here at our cottage on just a standard, typical night for us." "Just a cozy night," Markle interjected with a smile. "What were we doing? Just roasting chicken? Trying to roast a chicken. And it was just an amazing surprise. It was so sweet, and natural and very romantic ... he got on one knee!" "Yes!" Markle responded enthusiastically when asked if it was an "instant" yes from her. "As a matter of fact, I would barely let you finish proposing. I was like, 'Can I say yes now?'" "She didn't even let me finish," Harry said, laughing. "Then there were hugs and I had the ring in my finger and I was like, 'Can I give you the ring?' And she was like, 'Oh, yes! The ring!' So, no, it was a really nice moment; it was just the two of us and I think I managed to catch her by surprise, as well. SEE ALSO: Prince Harry and Meghan Markle are engaged: A timeline of their romance! As for the ring itself, it was reportedly designed by Harry, along with Cleave and Company, Court Jewellers and Medallists to the queen. It's on a gold band and features a cushion diamond from Botswana, along with two outside stones from the "personal collection" of Princess Diana. The couple first met back in July of 2016 on a blind date at a private members club through mutual friends. They went on two back-to-back dates before going camping together in Botswana a few months into their relationship. 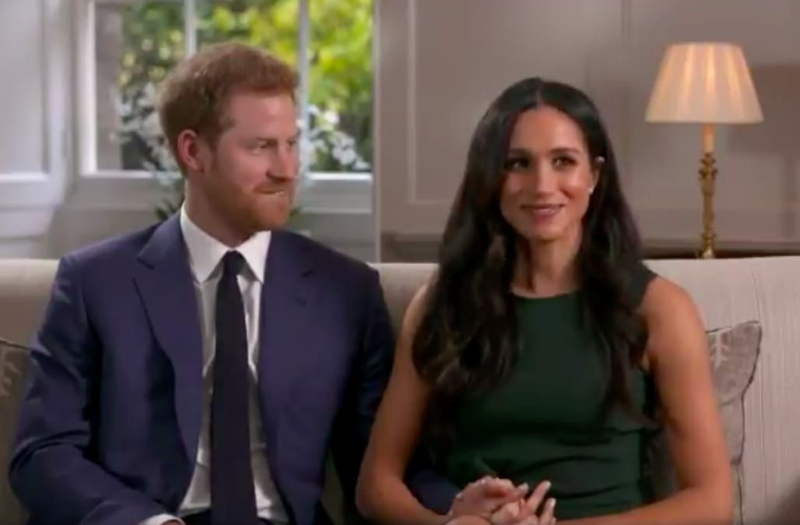 Markle called their first five or six months together "amazing" because their romance hadn't become public knowledge yet. Before going on a date with Harry, though, Markle had one question for her friend: "Is he nice?" "If he wasn't kind, it didn't seem like it would make sense," she said. After a highly successful first two dates, the couple "never went longer than two weeks without seeing each other." Neither knew much about the other before they met, which Markle considers a blessing. "Everything I know about him, I've learned through him," she said with a smile. My favorite part of all of this is that Queen Elizabeth watches Suits.